The Gerbil made its debut in the UK around 1964, and quickly established itself as a popular pet. In 1969 the first ever Gerbil Show was held by the Birmingham Mouse Club on 23 February. The event was a big success with more gerbils being shown than had been expected, all were Golden Agouti Gerbils and the winning gerbil was owned by a Bert Gardener, the judge that day was H. Smith. The standard for the Golden Agouti was published in the Fur and Feather magazine on April 10th of that year. In May in 1969 the National Gerbil Club was formed. The announcement was made in the Fur and Feather by Bert Cooke. Little is known of this club, other than it run till possibly the early 1980's. (Anyone who has any information about this club is asked to contact eGerbil). The first major show that gerbils were represented in was the London Show in late 1969, judging was done by Bert Cooke and the winning gerbil was owned by Eric Jukes and Tony Jones. The London Show today is a large event and Gerbils are still shown, it is one of the most popular shows in the Gerbil calendar with well over 100 gerbils being exhibited, although nowadays the range of colour varieties in show is far greater. Over the next year, 1970, many gerbil shows were held around the country, most organised by the Mouse fancy, eventually in December 1970 the Mongolian Gerbil Society was formed, announced in the 3rd December issue of Fur and Feather by Keith Smith, acting secretary, and the first standard for the golden agouti was published in January 1971. By September of 1971 the society was known as the National Mongolian Gerbil Society and held its first show on Sept 5th at St Albans. Over the next few years several Gerbil Societies sprang up, including the Northern and Midlands Gerbil Society and the Southern Gerbil Society, these were both affiliated to the National Mongolian Gerbil Society. Percy lists in his catalogue four varieties of gerbils, the Egyptian Gerbil, priced at £1.75 each, the Mongolian Gerbil priced at £1.00 each, Mongolian Albino Gerbils priced at £1.25 each, as no albino gerbil exists to date, we presume that he was describing gerbils carrying the himalayan gene which was one of the first gerbil mutations to appear. Also hand written underneath these was the addition of the 'New Cinnamon' Gerbil which was priced at £7.00 a pair, we presume that here Percy was describing the Argente Golden which was available around 1977 with the appearance of the Pink-Eyed Dilution Gene. The National Mongolian Gerbil Society established itself quickly, producing newsletters and holding shows around the country. In 1996 the name of the society was simplified to the National Gerbil Society. In 2000 the Society celebrated its 30 years anniversary. So to bring us up to date, The National Gerbil Society was formed in 1970. It is the British society for the promotion of Gerbils as pets and exhibition animals. Members are invited from the British Isles as well as overseas. All members receive a quarterly newsletter containing the latest gerbil news, show reports, articles, member's letters and information on gerbil care. A yearbook is also sent to members each year detailing current breed standards, NGS rules and show regulations. The NGS has close links with Gerbil Societies around the world. Members are invited to exhibit and compete for trophies and rosettes at NGS shows held at various locations throughout the year. Attending one of the NGS shows is great fun; you have the chance to meet active members of the society and you can also see some of the rarer gerbil species that members bring along for either display or to enter into the Exotic class. This is probably the only chance you will get to see some of rarer species. 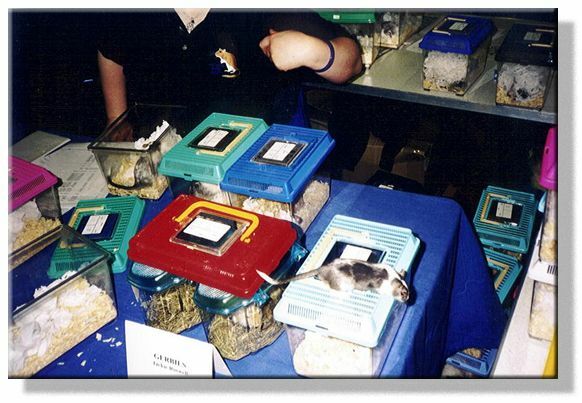 Many exhibitors also bring along a sales tank to the shows, with a percentage of the sales being given to the Society, thus giving gerbil enthusiasts the opportunity to purchase gerbils of the highest quality and in colours not normally seen in pet shops. Whilst raising money for the society, the members are also on hand to answer any gerbil questions you may have. The Society provides care/fact sheets which you can pick up at the shows free of charge; the care sheets also cover caring for some of the gerbil species such as Shaw's jirds.